“Ancient souls with experience of consciousness and community from more spiritually advanced civilizations are here on this planet to be themselves to the fullest extent possible in order to help support each other and heal human culture so that the planet may thrive. The challenge can be that such ancient souls can feel out-of-place here on Earth for a time, as they go through an adjustment process and remember their healing mission on this planet. These souls hold much inner wisdom of Star Peoples and civilizations far and wide in this galaxy and beyond. This inner wisdom vibrates at a higher level than the frequencies of fear, aggression, dominance, and disconnection that are a part of the global human wounding they are here to help heal. This is why ancient souls are needed of course, to help offer a different reality which is more whole and connected to oneness and love, but the challenge is not to lose belief and honouring of your own true inner wisdom and deep Soul truths whilst becoming a member of a culture that is still so different to yours. This Oracle comes to you to provide much-needed spiritual recognition that you have wisdom and understanding within you that is very ancient and flows from the Soul, and that you also have a sacred connection to wisdoms that come from Star Peoples of Sirius and other celestial beings that serve through unconditional love. This is neither strange nor weird, but it is precious and although you are not the only one of your kind here, it is far from a common Soul type on this planet, mostly because it takes a lot of strength and dedication to be able to sustain existence purposefully in a vibration that is lower than your own natural vibration. This Oracle comes to you with an offering of guidance – remember who you are within, do not try to fit with external models of how to be in this world, for you are here to help birth a new way that is more aligned with spiritual truth. Ritual To Heal In The Temple Of Lapis Lazuli: “If you have any crystal pieces of Lapis, any jewelry or any deep blue toned clothing, candles or crustals, such as sodalite, that you would like to use in your healing space as you complete this Ritual, please do so. You may also wish to use any crystal that aligns with the higher vibrations of the crown chakra, such as phenacite, apophyllite, danburite or clear quart, placing them around you as you sit comfortably, with your spine relatively straight. Close your eyes and imagine traveling within yourself on your breath, until you enter a peaceful, open, vast space behind your eyes. You sense a vibrant, dark, indigo-blue sky, rich life velvet, dotted with golden lights, like glorious stars. The sky and its stars feel ancient, endless and seem to exist beyond dime and space. You feel at home – longing and heart-opening fill your being, a deep remembering that you cannot quite explain and a sense of love from the great beings that animate the stars. The rich, blue and gold energies of the sky and stars begin to swirl into patterns, weaving and twisting and turning with joyful dance. You feel yourself drawn by your heart towards it, and it weaves around you, forming a temple of pure energy. You sense the temple opening all around you. Underneath you, a healing seat has appeared, and the floor, walls and ceiling, and all the furnishings within are gleaming vibrant blue lapis lazuli with flecks of gold pyrite. The light of the stars glows brightly filling every air particle with brightness and peace. Imagine you can rest back into your healing seat and gaze to the sky above you that opens as if you were in a cosmic observatory. You notice certain golden orbs of planets and stars that feel familiar to you deep in your being. Allow yourself to receive love and light from these planets, these places that you have been before, that your Soul vibration recognizes. You may feel joy, sadness, homesickness or peace and delightful recognition as you feel connection with these energies more consciously. Don’t seek to understand, just allow. Be aware of the light codes, transmissions of sound (whether heard or beyond your physical hearing capacity) and blessings of love that are transmitted to you now either through the crown of your head, or directly behind your eyes into the vast space in which the Temple of Lapis Lazuli sits. Know that whether you are consciously aware of the material or not, it is being offered to you now in unconditional love. When the transmissions have completed for now, allow the energy to travel right down into the earth below you. As the energy connects with the earth, you feel yourself drawn back towards your body, safely wrapped in the light you have received. You are anchored back to the earth in this love and light, this awareness, deep into your belly and through the soles of your feet. You feel the love that you have for the Earth, the desire that you have to shine your light to help Her and be helped by Her, the deep love that exists between you. Allow your belly and feet to feel nourished by your earth connection. Enjoy the feeling of having a place to land, an Earth garden to nourish with your Soul light and love so that beauty may grow. Enjoy your sense of belonging on this planet at this time o great spiritual emergence. You are so loved you belong here and are needed. 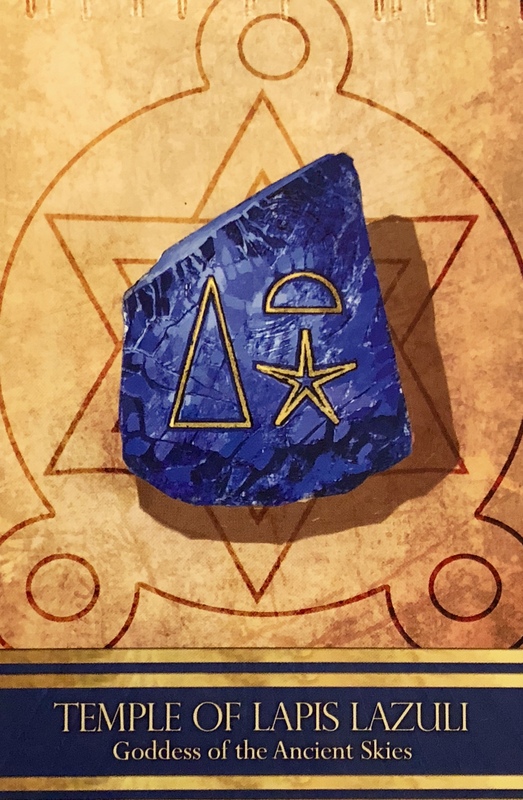 Invocation To The Temple Of Lapis Lazuli: “You can say this invocation at the end of the Ritual above or on its own at any time you need assistance with higher Divine Guidance from the purest source. With each moment we are offered a chance to make a new choice; steer our lives in a new direction; take a bold and courageous step towards creating something new. With each day, each week, each month and each year these choices form our lives, our choices creating our experiences which create our realities. There are times when our powers of manifestation become more pronounced, during new moons and full moons, as well as during certain astral alignments. Today is the new moon in Pisces, so the emphasis is on emotional sensitivity, intuition and creativity. This is the perfect time to get in the water, swim in the ocean or take a salt bath. Set your intention to use your inner GPS, your intuition to guide you. Release what no longer serves to make space for what you mindfully choose to create. This message is a powerful gift and if you choose to do the meditation and follow through with receiving the attunement on offer, it may just shift you into a new dimension of Being in the world. It is a message of healing, and of receiving; an invitation to call upon all the lifetimes you have experienced on this planet and gather up all the wisdom, knowledge and skills or talents you have honed over the ages. It is perfect timing to unearth your deepest authenticity, and to present the absolute truth of You into the world. To share your gifts. To shine your invaluable light and to become an anchor for the force of Unconditional Love that is coming to the planet now. We are in a pivotal time. There is fear and chaos all around us. Will we be sucked into the drama of it all and live in survival mode, fearing and doubting? Or will we ascend beyond the illusion? Most importantly, what can we do to be of service and how can we heal collectively and come together to help the planet? How can we co-create this new reality while not buying into anything that does not support the Highest Good Of All, and what is your part in it?